Just after the two weeks of last beta, Apple has released the 5th beta of its next big update to iOS. 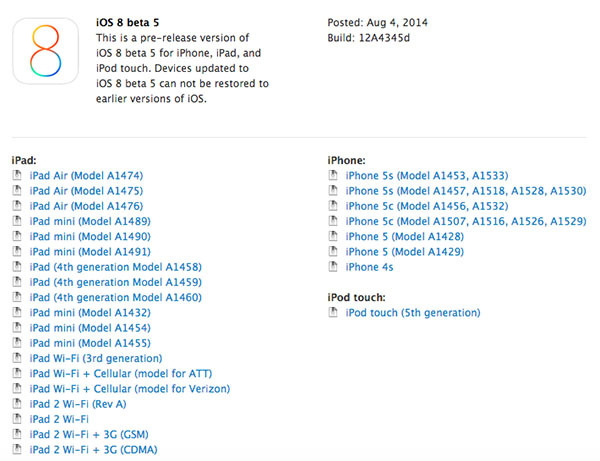 iOS 8 beta 5 is now available for iPhone, iPad and iPod touch. If you’re a registered developer you can get the beta both from the Developer portal and via the OTA update. This beta release has a build number of 12A4345d and packs several bug fixes and enhancements. One of the changes is in the Health app that now also tracks the Spirometry data. We are exploring the beta 5 on our devices and will update you as we find any change. Stay tuned! Registered Apple developers can download the beta from here.